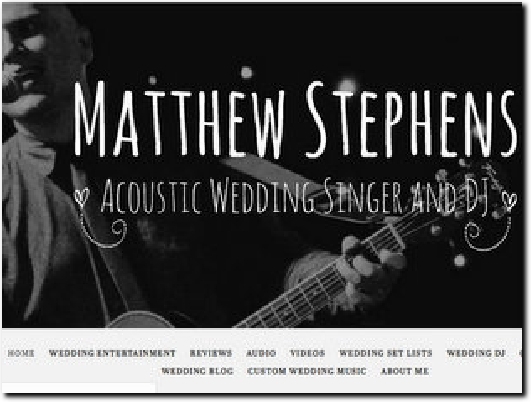 I am Matthew Stephens – an experienced UK wedding singer and wedding DJ based in Yorkshire, available to hire for weddings and parties of all kinds anywhere in the UK. There's a genuine buzz I get from helping people take care of their wedding! It gives me a massive feeling of satisfaction! Nothing pleases me more than hearing the words, "Thank you Matthew! You've really put my mind at rest!" Contact me today for a quick quote and hire me ALL DAY for £699! An acoustic wedding singer, guitarist and DJ with twenty years experience in performing live, serving Yorkshire, the surrounding counties and further afield if required. There is lots of information on the Home page while the Wedding Entertainment section has details of what Matthew can provide. He will even perform custom wedding music for you, providing specially-created versions of your songs. There are lots of enthusiastic reviews on the site, and a Quick Quote form for you to complete, which also has a contact phone number.